As we wrapped up 2013 last week, I was thinking a lot about the progress of my blog in 2013. When I look back at the beginning of the year, I see a big difference, and feel really excited about the changes I’ve made and goals that I’ve accomplished. One of the things I worked extra hard on this year was my blog photography. When we moved to California, right at the end of 2012, I decided to take a fresh start and really focus on the photos I put on my blog. Of course, my photos weren’t amazing right away, and even still (a year later) I’m still working to improve them, but the difference a year of practice, experimenting, trial and error, and creativity has made has been huge. You may know that I take 80% of the photos on my blog. More than half of my outfit photos are taken by myself with a tripod. And if you didn’t know this, then I’m doing something right, because my goal with each tripod shoot is to make you think that a real photographer took them. At least once a week I get questions about my photography, and when people find out I use a tripod, they ask for advice. So here we are…everything I’ve learned about being my own blog photographer. Grab a snack or something, cause here we go! all photos taken with my tripod. The photos at the top of the collage went very dark for some reason when I uploaded it and are not like the original. Just so you know. First of all, let me tell you a few of the reasons why it’s important for me to have great photography. People appreciate and are drawn toward beautiful photos. People are more likely to engage and stick around on a blog that has beautiful photos. People are more likely to pin beautiful photos. You may say it’s superficial, but I say it’s reality. Even if you just blog for fun, you want to engage your readers, and you probably still want to gain a greater readership, and making an effort with your photography is definitely a huge part of that. 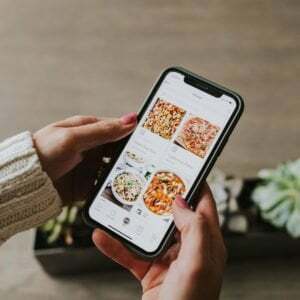 The power of blogging and social media is unmatched these days, and companies are reaching out to bloggers for all kinds of great advertising. For me, those companies who I work with, who are sending me their product for a feature, deserve my best work. I want to make each collaboration special and memorable to them so they want to maintain a relationship. My blog is my portfolio. I don’t really know where I’ll be in five or ten years, or what opportunities will present themselves, but when companies or people find my corner of the internet, I want them to really be able to see what I do, and be able to focus on my content without the distraction of poor photography. In fact, just in the last few months, I’ve tried to make every photo, even my simple tutorial step photos better, because I’m realizing that every. photo. counts. Every single company, website, or idea has to constantly be improving and morphing to the demands of society. If you’re not consistently and proactively evolving, you can easily get left behind. For me, constantly improving my photography helps me along that path toward bigger and better things every day. So now that you know why I do it, let’s talk about Materials. Tripod: I have a really basic one, like this one from Amazon. I’ve had it for three or four years and it’s basically still in brand new condition. No need to buy anything fancy — just as long as it’s one that extends roughly to your height. Lenses: I’ve owned a handful of lenses over the years since I got my DSLR, but I’ve loved none as much as my 50mm f/1.4 lens. It’s pricey, but it allows you to get a really nice blurred background, is great in low-light situations, and just takes gorgeous photos. It’s the only lens I use for my blog photos now. Camera: I started out with a Nikon D40x (now a discontinued model) and then upgraded to a Nikon D7000 two years ago. The D7000 is a much nicer camera, but that doesn’t matter for this — you just need a camera that works with a remote. Photoshop: I have Photoshop CS4 that my husband bought me after I graduated college, but I’ve also worked with Photoshop Elements and it has a lot of the same capabilities (and is a lot cheaper). Commitment. About a year and a half ago, when I finally got the courage to take my pictures outside, I stuck to the same location — the grassy area behind our condo building. Then when we moved to California, I upgraded to two locations — the walkway in front of my house, and the alley behind my house. Then when my husband agreed to start taking my photos, we added one more location into the mix — the street next to our house. After I while, I realized my photos all looked the same, and I felt like it was time to move to the next level again, and I decided it was just time to bite the bullet and start taking my tripod to location shoots. This is where I am today. I still force my friends and my husband to take my photos when they can, but most of the time it’s just me and the tripod. It’s a commitment, especially with two kids, but it’s a commitment that I’ve decided is worth it for me (see paragraph above about why it’s important to have great photography). Outfit shoots with a real photographer take 5-10 minutes. Tripod shoots take me 25-30 minutes. So plan for the extra time. When my husband took my pictures, we would do them at dusk when he got home from work. Now with Daylight Savings, it gets dark so early (which is why he doesn’t take my photos at all anymore), and I have to work around my boys schedules. I typically go around 10:30 or 11:00 am, and just stick to shady areas so I avoid any harsh shadows. I’ve also found that Sunday afternoons are good for me. My husband always takes a nap after church, as does the baby, so I grab several outfits to shoot and then bring Peanut along with me for an hour. Business complexes are deserted on Sundays, so I get most of my urban shots in on those days. The several locations I go to have a big parking lot, or are part of a park, so I park the car and then let Peanut get out and play by the car with some toys I bring along. Buck stays in the carseat with the doors open or the windows rolled down, and is either asleep, or gets a snack to keep him content while I shoot. This is a huge part that I forgot to mention. Learn your camera! I only shoot in Manual Mode, and although it’s a steep learning curve, your photos turn out unbelievably better when you know how to use it. I learned by reading a lot of online tutorials and a LOT of trial and error. For me, I think the nice blurred background makes your outfits really stand out without a lot of background distraction, and working in manual mode is the only way to get your depth of field as shallow as it can go (which achieves that super blurry background). Otherwise the camera just chooses for you. There are a million tutorials and posts out there that cover how to use it, so I won’t even get into it. But LEARN. YOUR. CAMERA. Location, obviously. I’m always on the lookout for new spots that will work. Also, see above. Angles: Try lots of different shots — super wide angles, close-ups, from the back, side, etc. The reason my shoots take so long is because I take about fifty photos, trying all sorts of different poses and angles. Some work, some don’t, but just keep trying new things. Poses: Maybe it’s because I’ve been doing tripod photos for so long, but I can spot a tripod photo from almost a mile away. Usually it’s because of the poses or the facial expressions. People make faces and do poses for a tripod that they typically wouldn’t for a photographer, and to me they stand out. Pretend there’s a person taking the photo, and just be as normal and relaxed as you can. Yes, it’s awkward that you’re taking photos of yourself, but move past it and act as natural as possible. I use AutoFocus, and I make sure that my Priority Selection is set to Focus, rather than Release (since release allows it to take a photo even if it’s not focused). Make sure your camera is set to as many AutoFocus points as possible. Mine allows either 11 or 39, so I always have mine on 39, which helps the camera keep my whole body in focus while shooting. Put your remote on a two second delay so you have time to hide the remote. Check your camera’s manual to figure out how to change this setting. Edit your photos. Don’t post unedited photos. Just don’t. I try to take good enough photos to avoid a lot of editing, but a few simple adjustments make a huge difference. I almost always boost the exposure a bit to brighten up the photo, adjust the levels to darken the darks and lighten the lights, use the Dodge tool to brighten my face specifically, and then sharpen the photo using Bloom and Grow’s “final sharpen” action in her Basics Action Package. Whew. Did you make it? Am I forgetting anything? If you have any other questions, please leave them in the comments! Also, in case you want even more stuff to read, check out what I’ve written at Babble so far this month! Thank you very much for your advice, as always very useful! I am also now engaged in the creation of photography and developing in this direction. I recently read about Lens Flare which can perfectly change your photo for the better. This is great! Haha! Try holding a bag — it gives you something to do with your hands other than on your hips! Wow, I totally thought your husband was taking all these photos! Also, I am so glad to see hear about someone as accomplished and put-together-looking as you also has two kids playing quietly (or whining) nearby! I wondered how you did it, and now I love your photos even more when I can imagine the sweat that goes into each one. Beautiful work… you're doing a fantastic job, mama! Just thought of a question: do you use the manual settings at all or do you just set it on automatic and trust the camera? And then edit later, as you already mentioned? Thank you for your nice comment! And yes, I do it all in manual — I updated the post to talk a little bit about that. So glad you reminded me to add it! Merrick- great post! I'm not interested in getting into blogging my self, but I found everything you had to say really interested and informative! I've definitely noticed the change in your photots, so I would say, keep up the good work. I even like the ones of you on your couch every now and then– it gives you a really personable and cozy look :). So glad you posted this!! I was going to comment the other day to see who was taking your photos 🙂 Do you also take the photos of your family? I didn't take our Christmas photos, if that's what you're asking. They were taken by Sara Walk Photography! Your pictures are beautiful. What kind of camera do you use (I'm guessing some sort of Nikon to match the lens you linked)? Do you just put it on auto mode, or do you use manual? Did you take a class, or just learn settings with trial and error? And about editing, I guess I am unfamiliar with the "Dodge" feature, etc. Is that a part of photoshop? Yes, Dodge is just a lightening tool on the sidebar. Photoshop and Photoshop Elements both have it! I love this. I need to be better about my photos. I'm much too dependent on my iPhone. This was incredible helpful! THANK YOU! My boyfriend takes my pictures when I do outfit posts, but I'd like to start doing more and these tips will be so helpful. I got the tripod and remote for Christmas, now I just need to work up the courage to go find spots to take the photos where not toooo many people can see me. I'm chicken! And living in the city we don't have a backyard or private outdoor space! Awesome post. I was always curious about the inner workings of your photo shoots, and you've answered all of my questions! (I always really did wonder what the kids were up to if you took them yourself haha!) I've always loved your photos, and I'm now really in awe, knowing that you DO take them yourself with 2 kiddos behind the scenes! I can barely take selfies with my iPhone, but now I have a go-to tips section if I ever needed a reason to take real photos of myself! Thanks! Do you mess with the focus or do that on Auto? I struggle if there is not someone with me to get the focus right when it's just me. Thanks for the tips! Being your own photographer can be a challenge, but also very rewarding! I do hate the time element though, especially in the freezing cold winter. Often I'm wishing for someone else to be holding the camera! These are great tips, backed up by the fact that we see the good work you do on a near-daily basis. I think you're doing a fabulous job! I admire your dedication and commitment to learning a skill. Thank you for sharing. I love your photographs – your poses are so natural. Keep up the great work! OMG, I'm honestly in awe that you take the majority of your photos yourself, including the ones in this post, wow! Any tips on auto-focus specifically? That's what I always struggle with the most! Also, do you have an l-bracket? My tripod can't seem to hold my camera when I try to rotate to shoot vertically! Thanks in advance, you're a rock star. My mind has been blown. I had no idea you were using a tripod! Better photography is my blog goal for the year. So glad you use a Nikon. I've also had a canon inferiority complex, thinking I can't take good pictures because I don't have a $2k camera. Feeling inspired. Already signed up for a photography class. I'll use online stuff too, but with a 2 year old and a 2 month old who take tag-team naps all day, I don't have much time for myself, so I thought this way, I'll actually get started on it. You're awesome! Oh my gosh, this post is awesome. Thanks so much for all the wonderful tips, Merrick! Great post! I admit to following more photo pretty blogs than anything else, even if the content is really good. I think about that with my blog but I never feel like I have the time or the right camera to take better photos. You are so right about it being a commitment! Great advice! And I never thought about a remote. What a great idea! THANK YOU so much for this post! I am a tripod blogger photographer too & it is the most frustrating and yet somehow truly fulfilling aspect of my blog! this is AMAZING! not having a photographer has stopped/delayed me from blogging but thanks to you ill start trying again. this is really a great post AND and inspiration. thank you!! You completely had me fooled! I can't believe you don't have a photographer pro following you at all times! 🙂 Thanks for breaking this down for me – maybe I'll have to start some outfit posts! This is excellent advice. I actually am still learning to use my camera AND tripod but am starting to finally get the desired results! You are a great tri pod photographer and thank you so much for these tips! I bought one and haven't used it yet because like you mention, it just takes so much time. Thank you for sharing! These tips were very helpful! Oh my goodness. I've been meaning to ask you about this. Thank you so much for taking the time to put this all together. I know if will help a lot of people! Your pictures are all amazing. This was great to read! I would have never guessed that you use a tripod! In fact, as I read your posts I always wonder who is taking your photos — your husband, a friend. So obviously you're doing a great job! I've tried doing self-portraits and they are hard! But I also do not have a remote, so I have to set the 10 second timer and run & pose. Fun times. Anyways, thanks for the tips! Your pictures are always lovely! such a great post! thanks for the awesome tips! Thanks for all of the great tips!!! Wow, this is very detailed and extremely helpful! Thanks! lol… "….I just press the button and throw the remote", I thought I was the only one that does this. These are really great tips, I think learning your camera is definitely the biggest thing, I'm pretty good when the camera is "in my hand" but really struggle when it's on the Tripod. Merrick! This is amazing. I can't wait to dive in and use well, every single tip. Thanks for taking the time to share it. Ooh, such good stuff! I love how you've figured out a way to make it all (kids, clothing changes, locations) work together. Thank you for the excellent tips! This is SUPER helpful! Thank you so much! You truly are an inspiration! Your photos are always fantastic. You are right I stop looking at blogs (unless I know the blogger) with poor photography.Are your detail shots (of shoes, purses) cropped images then? Majorly impressed with your son to be present while you are taking hte self portraits!. thanks for this post, it is really complete and definitely has some helpful tips for me. Good job! Hi Merrick’s Art, I randomly came across your blog today and I am so happy I did. I instantly fell in love with your photos, and your content is great. I especially love this particular topic. I am also trying to build my blog and improve my photography skills, but I find it difficult with kids, and you have proved that it can be done! You are an inspiration, and I will definitely will try some of your tips! Thank you for all of the tips you provided. The focus can be a little fickle sometimes, but the remote should trigger the focus so it will adjust to focus on you when you’re standing in front of the camera. Good luck! Thank you for giving an insight on how to be your own photographer. Super helpful ! Your photos are beautiful, btw 🙂 I wouldn’t have thought that you took them by yourself if it wasn’t for this article. What size tripod do you recommend? I have a tripod, but feel like it does not go high enough to take photos. Mine is 57″ maximum and it’s a pretty good height. You want your camera to be about eye level with you! YOU ARE A LIFE SAVER!!! I’ve been wanting to start my own fashion blog for the longest, but I always thought “who’s going to take my pictures! ?” But now that I’m discovering the tripod, I can get things going now. I don’t have to depend on anyone to take my pictures for me, but it’s also nice to get help from time to time though. It’s just great to know I can be my own photographer! This was incredibly helpful! Thank you for taking the time to write it; my friend and I just started a blog, seekwandershare.com , and have been trying to learn all these tips and tricks but it is so so so much more helpful to get the details from a veteran like you! If you have time, we would love for you to check out Seek Wander Share, and would love to hear what you think! I don’t think any blogger would bother top share every detail like you have. This is an amazing blog post and had really got me hooked on to your blog. Lovely and great job!! Thanks for the awesome tips! One thing I learned recently that helps with not having to deal with the remote or feeling like pictures are staged is the timed interval setting. I have a nikon d5100 that I can set to take pictures automatically within a certain time frame and can adjust how often those pictures are taken. For example over a 2 min period I can set it to take a picture every 10 seconds. Everything is adjustable so you can set it to your own liking. Thought I would share that tip that I learned on pinterest. .. it has helped me a lot. Really enjoyed your post, thanks! Very nice and thank you! I’ve been trying to get better at tripod self portraits lately because I’d like to document my outfits, but to be honest I hate it. I’m much more comfortable shooting from, y’know, behind the camera. So hey! If anyone in the Denver area wants to swap taking pictures/posing with me, hit me up! Until then, this is great, thanks again! Thank you so much for the tips! I’ve recently started my own fashion blog, Minkerr.com and I’ve been looking for ways to improve my photography and these are amazing!! Quick question, do you have an tips on editing several pictures at once? I think Lightroom allows you to edit multiple pictures at once! But if I need to do a bunch quickly, I create an action in photoshop so I can just push play and edit it instantly. Hope that helps! These are great tips!! I needed this for inspiration to start taking style pictures. Definitely pinning for future use. loved all your tips lady!! thanks for sharing! Amazing tips thank you so much! I always find it so awkward taking outfit photos which is why I never end up posting them to my blog. I just need to relax more and I think i’ll look in to getting a tripod so then I wont feel as shy! Keep going with your blog because it all looks amazing! 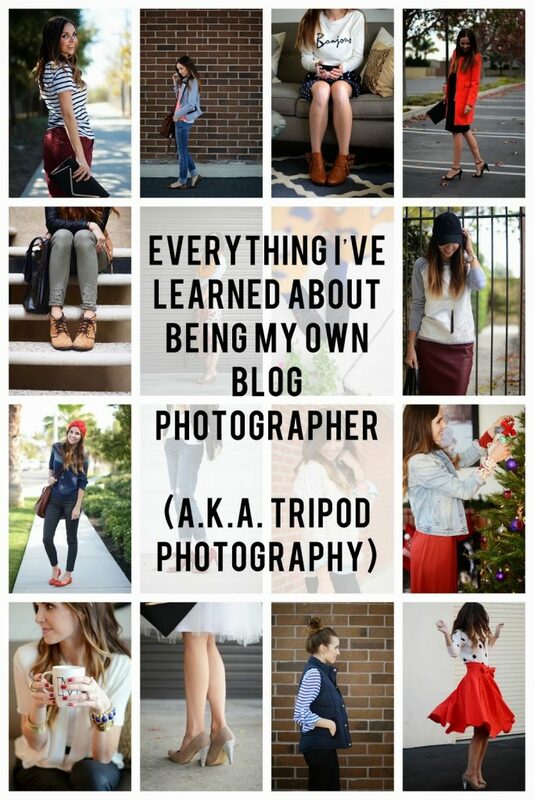 Thank you SO much for this post, it’s the best thing I’ve found on the internet on tripod photography, especially outfit photography related! This is such a great post! My biggest issue is getting out of the hosue and over the awkwardness! The RELatability and down to the earth nature of your content on this blog is truly refreshing. your endeavors in being your own photographer outdoors is very very inspiring to read! wOW!!! tHIS HAS BEEN SUCH A HELPFUL POST. mY BLOG IS VERY NEW, AND I JUST REALISED THAT I NEED TO TAKE MORE PHOTOS MYSELF SO THAT THEY ALIGN WITH MY BRAND. bUT I WAS TERRIFIED OF GRABBING MY TRIPOS STAND AND HEADING OUT FOR SHOOTS AND LOOKING WEIRD. HAVING READ ABOUT THE COMMITMENT THAT I NEED TO MAKE, I FEEL SO MUCH BETTER. tHANK YOU SO MUCH FOR THIS POST! What a great post. Many many thanks for sharing with us.